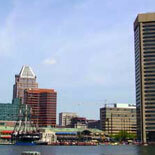 If you are looking for a delightful way to spend an afternoon, consider going on a Spirit of Baltimore Lunch Cruise. Located at the historic and famous Inner Harbor in Baltimore, the Spirit of Baltimore is a fantastic opportunity to learn about the history of Baltimore while at the same time enjoying a wonderful lunch and gorgeous 360 degree view of the harbor. This cruise tour is conveniently located near numerous hotels and major tourist attractions at the harbor. Lunch on the Spirit of Baltimore is buffet style and you can enjoy a wide range of delightful entrees and side dishes, along with wonderful desserts. Sample some of the bay’s famous seafood or regional dishes in the ship’s spacious dining room. The Spirit of Baltimore has two large heated interior rooms for you to enjoy the panoramic views of the bay in comfort. She can hold up to 400 guests easily and is a wonderful place to bring your entire family for an afternoon of fun and enjoyment. There is a dress code on the Spirit of Baltimore that is strictly enforced. Casual dressy is accepted, but no jeans, tee shirts, shorts, flip flops or sneakers are allowed on board. Children under the age of 3 attend for free, children from 3 to 12 are welcomed. The Spirit of Baltimore operates year-round. Reservations are recommended. Boarding time begins at 11:30 and it is recommended that you arrive 30 minutes before the cruise begins at noon. The cruise runs from noon to 2 pm, most days. Parking is available adjacent to the cruise boarding area. Prices for parking range from $5.00 to $10.00 per car. Tickets for the Spirit of Baltimore Lunch Cruise can be easily purchased at https://www.trustedtours.com/store/spirit-of-baltimore-lunch-cruise.aspx. Look for special deals and discounts that might be available when you make your reservation.